This tray will hold two carriers, three battleships and one dreadnought. 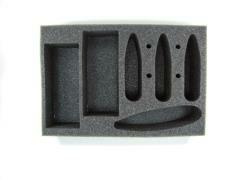 2 inch (50 mm) thick tray with 2x 5 3/4 x 2 1/2 inch (mm) cut outs. Trays are designed to fit side by side in the Spartan Games bag.